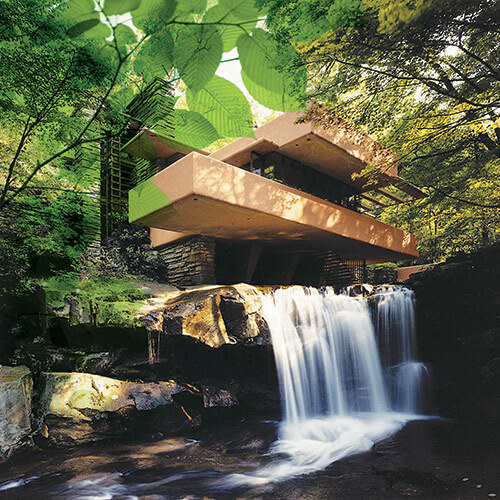 The style of Frank Lloyd Wright™ is timeless. To achieve a contemporary look and keep with Wright's design principle, PPG color experts have curated his stunning palettes and design tips to emulate his style. This earthy and neutral palette emulates lavish greenery, serene bodies of water and rich woods, combining various natural elements known to inspire Wright during his design years. Early on, Wright defined the principles of what he called an “organic architecture” and championed it throughout his 74 year career. Wright drew from two sources in determining his palette: the nature of the site and the nature of the building materials. Believing the architect should create total environments, he also designed art glass windows, furniture, fabrics, lamps, carpets, china, statuary, urns, and tiles. Graphic, landscape and automobile designs are also found within his body of work. Wright’s designs included residences, shops, hotels, religious structures, skyscrapers, civic centers, amusement parks, bridges, and museums. Authentic paint colors from this architectural landmark.